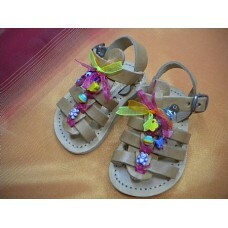 This Is the Classic Handmade Gladiator Sandal, Shrunken in size and made softer for tiny feet, It is an excellent choice for little ones as it is very difficult for tiny hands to remove or tiny feet to wriggle out of. It is then hand decorated with a selection of ribbons and charms. They are handmade by us in Greece with authentic traditional natural Vachetta leather, used in Greek sandal making since ancient times. It darkens naturally with age and wear becoming a gorgeous dark honey colour.